On Friday AAPL closed New York trading at $326.35, down $4.88 on the day. At that price Apple is trading at a price-earnings multiple of 15.55 times trailing 12-month earnings of $20.99 per share. This lowly valuation includes more than $70 per share in cash on Apple's balance sheet and is in the context of an earnings per share growth rate of 83.2% in the first six months of the current fiscal year. On June 12th I published my updated 12-month price target for AAPL of $590 per share. At Friday's closing price of $326.35 a $590 target price might seem ambitious. It's an anticipated 80% rise in the share price in roughly 12 months. But as I will detail in this article, AAPL is trading not only at a low historical p/e multiple since the elimination of deferred revenue accounting on the iPhone in FQ1 2010, but is also trading significantly below the current price targets of the Wall Street pros. For this article I asked Jeff Fosberg of the Apple Finance Board to update his popular "coiled spring" graphic to reflect Friday's closing prices for three popular publicly traded enterprises: Amazon, Apple and Netflix. The graphic compares the valuations of the three companies based on current price-earnings multiples and the gap between the current median price target from Wall Street analysts and Friday's closing prices. I do not view price-earnings multiples as an effective means to compare companies in dissimilar industries. Amazon, Apple and Netflix do not compete directly in their respective core markets and Apple's hardware products are revenue conduits for products and services offered by Amazon and Netflix. The markets for the Amazon Kindle and the Apple iPad only partially overlap. However, comparing the gap between current trading prices and Wall Street price targets makes for a compelling contrast between the valuations of the three companies. No matter the 82.3% rise in eps in the first six months of Apple's current fiscal year, the average estimate among analysts calls for eps in FY2011 (ending in late September) of $24.76 versus $15.15 in FY2010, a gain of 63.4% with less than six months remaining in the one-year period. For FY2012 the current average eps estimate of $28.72 represents only a 16% gain above the estimated current fiscal year eps performance. Few enterprises in recent history have captured the imagination and stirred the emotions of consumers like Apple. Ask most anyone their view of Apple and one is apt to hear spirited responses ranging from high admiration and praise for the company to complaints about the way Apple seeks to control virtually all aspects of the user experience and the content available to purchase through the various iTunes and app stores. No matter the strong sentiment about Apple, few can dispute the company's extraordinary success and potential for continued growth. At Friday's closing price of $325.90, the shares are trading at levels last seen in the closing days of calendar year 2010. This is despite the fact the share price reached an all-time high of $364.90 in intra-day trading on February 16th. There are, of course, macro economic factors impacting Apple's share price performance and investors are currently trapped in a challenging market cycle. But for the first six months of the current fiscal year Apple's revenue has risen by 76.2% and earnings per share has moved higher by 83.2%. These rates of growth and anticipated similar rates of growth for the remainder of this fiscal year are not currently priced into the company's shares. On May 31st I published a posted titled Why I'm Bullish on Apple. In that post I mentioned the company's prospects for growth and the factors that will deliver outstanding revenue and earnings growth well into next fiscal year and put forward my current 12-month price target for AAPL of $590 per share. In this post I'll mention a number of other important factors that will deliver an 80% share price gain over the next twelve months. I anticipate Apple will move back into a share price trading range of 17 times to 20 times trailing 12-month earnings that prevailed prior to April of this year. That trading range in future periods will represent a compression of the share price relative to earnings when the company's high cash balances are factored into the numbers. The graph and table data below detail Apple's share price on the first day of the month following the release of the company's quarter earnings over the most recent six fiscal quarters and my share price forecasts for the next four fiscal quarters. The Apple Finance Board is home to some of the best known and hardest working independent AAPL analysts on the blogosphere. As a service to the members of the AFB, a popular and well respected discussion board, I'm hosting the index of AFB AAPL price targets and share price forecasts developed by the members. Index participants submitted AAPL price targets for the first trading day of the month following the release of Apple's quarterly earnings reports through May 1, 2012 and associated ranges for the share price. The dates chosen for the quarterly price targets represent the first trading day of the month following the release of Apple's quarterly earnings reports, providing time for the markets to adjust the company's valuation based on the the most recent quarterly numbers. Comments on the index can be made at the bottom of this post and for registered members of the AFB in the topic created specifically for this discussion. 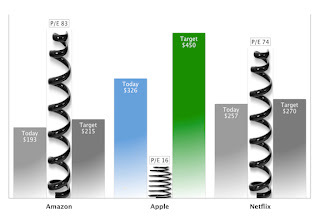 The graphs and data table below indicate the average AAPL price targets of the index participants. The price targets and price range forecasts of each of the participants is listed below the averages. Thank you to the AFB members participating in the index for the benefit of our readers. There's no disputing Apple's success since the release of the iPhone four years ago. Last week I published a forecast that suggests Apple's revenue for the fiscal year ending in September will reach $112 billion, up from $65.225 billion in FY 2010. In the recent March quarter the Apple iPhone represented roughly 50% of the company's revenue. The release of the Apple iPad has accelerated the company's revenue growth and contributed significantly to the 83% revenue gain in the same March quarter. Sales of the Apple iPad may create as much as 25% of the more than $40 billion in revenue I expect the company to generate in the upcoming holiday quarter. But for all of the attention lavished on the iPhone and the iPad, there is a component of Apple's continuing success that is often overlooked. It's the success of Apple's retail stores and in particular the positive impact Apple's global chain of over 300 retail stores is having on Apple's oldest and most enduring product, the Macintosh line of personal computers. The graph and table data below illustrate the continuing rise in Apple retail store revenue and the corresponding percentage of total revenue generated by retail store activity. For the first six months of FY 2011 (the December and March quarters) retail store revenue rose 92.6% and represented 13.7% of the reported revenue for the company. In the same six-month period Apple's total revenue rose 76.2%. Over the most recent four fiscal quarters the pace of revenue growth at the retail stores has outstripped the pace of revenue growth for the company as a whole. The rate of growth in retail store revenue is due in part to the opening of new stores and in part to the mutual halo effect among Apple's hardware device lines. The debut of the Apple iPad just over one year ago has had a positive impact on retail store foot traffic and the resulting sales activity.